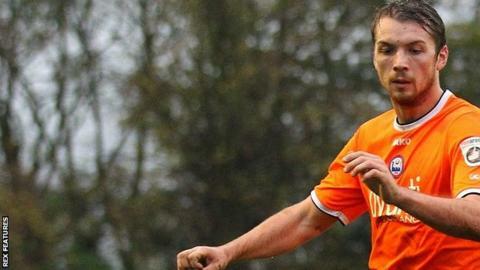 Michael Cheek hit a hat-trick as Braintree won an incredible nine-goal game at bottom-of the-table FC Halifax. Alex Woodyard's 30-yard effort put Town ahead and although Jordan Burrow's shot levelled matters, two Cheek strikes and a Kenny Davis penalty put the visitors in control at 4-1. Shaun Tuton's 12-yard shot and fine volley gave the hosts hope at 4-3 down. But Cheek's fierce volley sealed his treble and Sammie Szmodics lobbed a sixth to end the scoring on 57 minutes. Match ends, FC Halifax Town 3, Braintree Town 6. Second Half ends, FC Halifax Town 3, Braintree Town 6. Attempt missed. Sammie Szmodics (Braintree Town) right footed shot from the right side of the box misses to the right. Offside, FC Halifax Town. Shaun Tuton tries a through ball, but Shaun Tuton is caught offside. Shaun Tuton (FC Halifax Town) hits the bar with a right footed shot from the left side of the box. James Bolton (FC Halifax Town) is shown the yellow card for a bad foul. Attempt missed. Jordan Burrow (FC Halifax Town) header from the centre of the box misses to the left. Offside, Braintree Town. Sammie Szmodics tries a through ball, but Sammie Szmodics is caught offside. Attempt saved. Keil O'Brien (FC Halifax Town) header from a difficult angle on the right is saved. Assisted by Nicky Wroe. Substitution, FC Halifax Town. Josh MacDonald replaces Samuel Walker because of an injury. Attempt missed. Keil O'Brien (FC Halifax Town) right footed shot from outside the box is too high. Attempt saved. Michael Cheek (Braintree Town) left footed shot from the left side of the box is saved. Attempt saved. Jordan Burrow (FC Halifax Town) left footed shot from the left side of the box is saved. Goal! FC Halifax Town 3, Braintree Town 6. Sammie Szmodics (Braintree Town) right footed shot from the right side of the box to the high centre of the goal. Attempt saved. Dan Sparkes (Braintree Town) right footed shot from the left side of the box is saved. Attempt saved. Jordan Burrow (FC Halifax Town) header from the right side of the box is saved. Goal! FC Halifax Town 3, Braintree Town 5. Michael Cheek (Braintree Town) left footed shot from a difficult angle on the left to the top right corner. Assisted by Mitch Brundle with a cross. Attempt missed. Samuel Walker (FC Halifax Town) left footed shot from outside the box is too high from a direct free kick. Foul by Dan Sparkes (Braintree Town). Kieran Sadlier (FC Halifax Town) wins a free kick. Substitution, Braintree Town. Matt Fry replaces Sam Habergham. Second Half begins FC Halifax Town 3, Braintree Town 4. First Half ends, FC Halifax Town 3, Braintree Town 4. Attempt missed. Michael Cheek (Braintree Town) header from the right side of the box misses to the left. Assisted by Dan Sparkes with a cross. Attempt missed. Scott McManus (FC Halifax Town) right footed shot from the right side of the box is too high.